The smoked pork belly taco at Smoke BBQ in Audubon layers slow-cooked morsels of pork with a mango salsa that's also been smoked. The brisket at Smoke BBQ in Audubon is minimalist in the Texas style, but peppery, tender, smoky, and good. That alone, plus a proper pink smoke ring around most all of the other meats here (the St. Louis ribs are particularly good), are worthy reasons to visit this ambitious pit stop and BYOB with a pleasant patio in rising downtown Audubon, where Clark and other locals are buzzing about a new brewpub in the works (not to mention nearby Tonewood, whose "Fuego" IPA might be thematic perfection to pair with Smoke's barbecued meats). 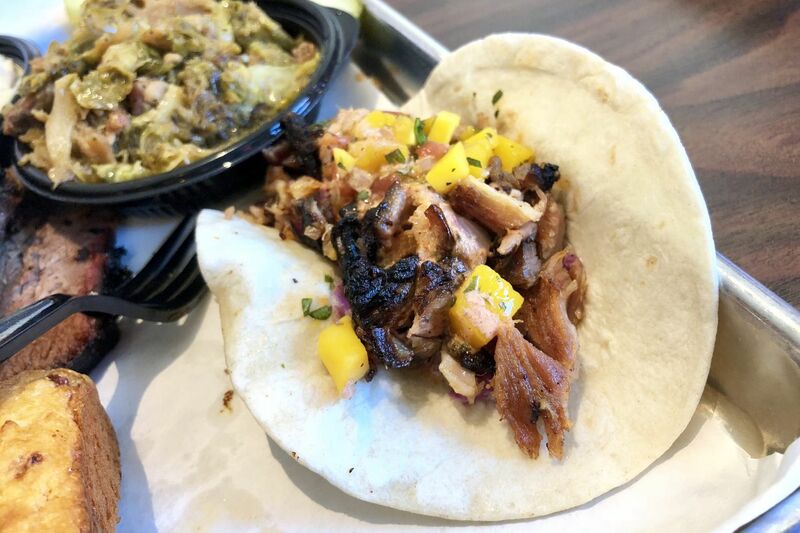 The most distinctive dish at Smoke, however, is a Tex-Mex twist on barbecue: a trio of tacos topped with smoked pork belly and mango salsa. The flour tortillas wrap feathery chunks of moist flesh that are unctuously soft and perfumed with the campfire aroma of their own 10-hour smoke, with just enough textured bits of charred spice rub on the meat to counter the fatty richness. But good tacos are always more than the sum of their parts, and what I really love here is the extra touch of a mango-habanero salsa that doesn't simply bring refreshing bursts of exotic fruit and a bright Caribbean heat from the peppers, but an extra layer of savor from the salsa's own turn in the smoker. Smoke BBQ brings a legitimate barbecue contender to downtown Audubon.